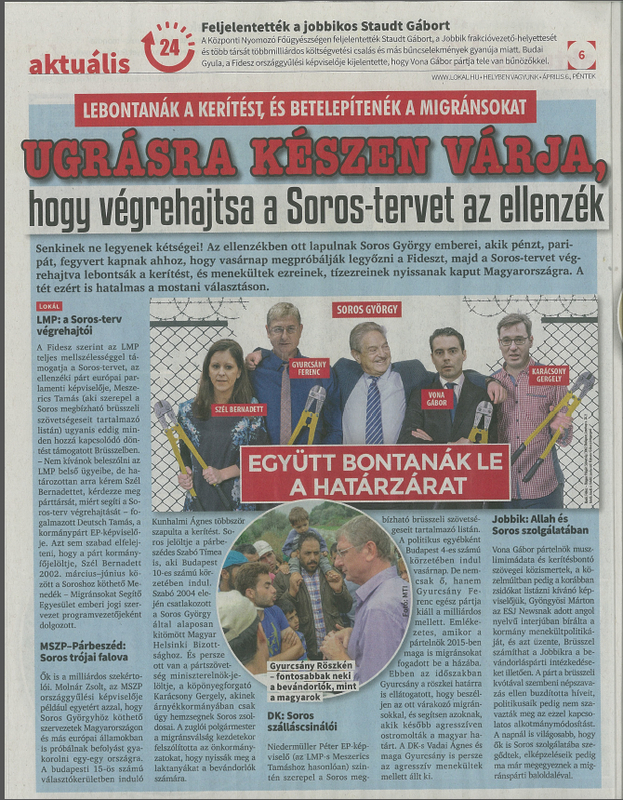 Below are scanned images from the final two issues of the free daily newspaper Lokál and the final issue of the free weekly newspaper Lokál Extra published before the April 8 National Assembly election in Hungary. 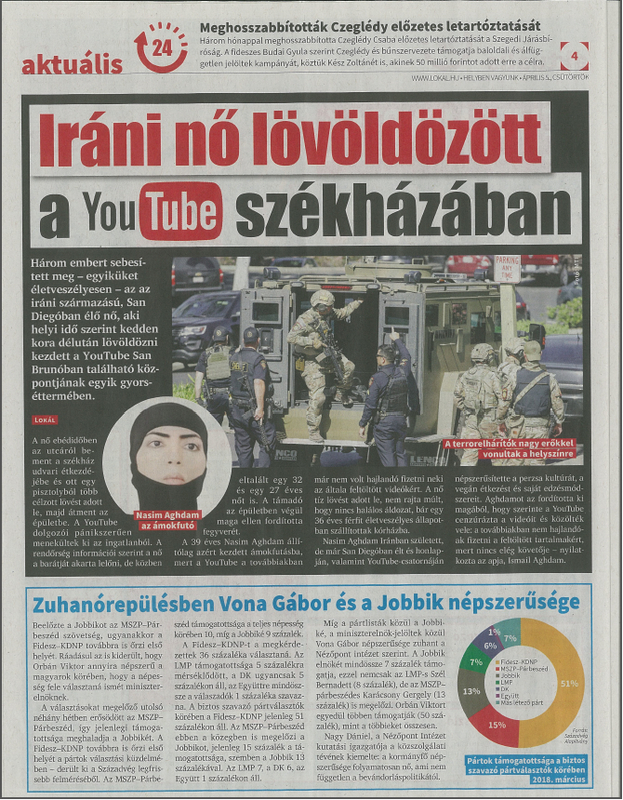 Lokál has a daily circulation of 150,000 copies and is distributed at public-transportation, railway and inter-city bus stations in Budapest. 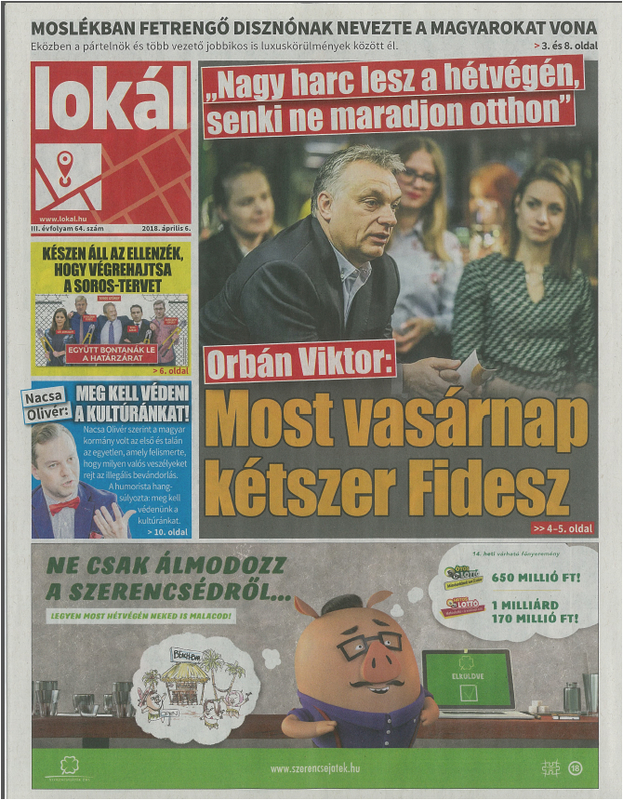 The 24-page Lokál Extra has a circulation of 1,160,000 copies and is delivered to homes and residential buildings in Budapest and 24 other cities in Hungary (source in Hungarian). 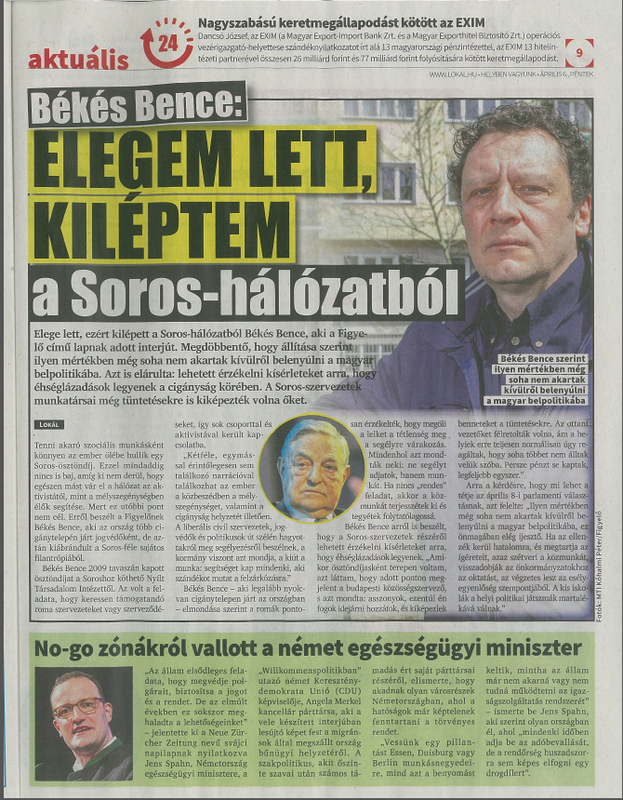 The newspapers operate under the ownership of Prime Minister Viktor Orbán’s chief strategic adviser Árpád Habony and former legal adviser Tibor Győri. 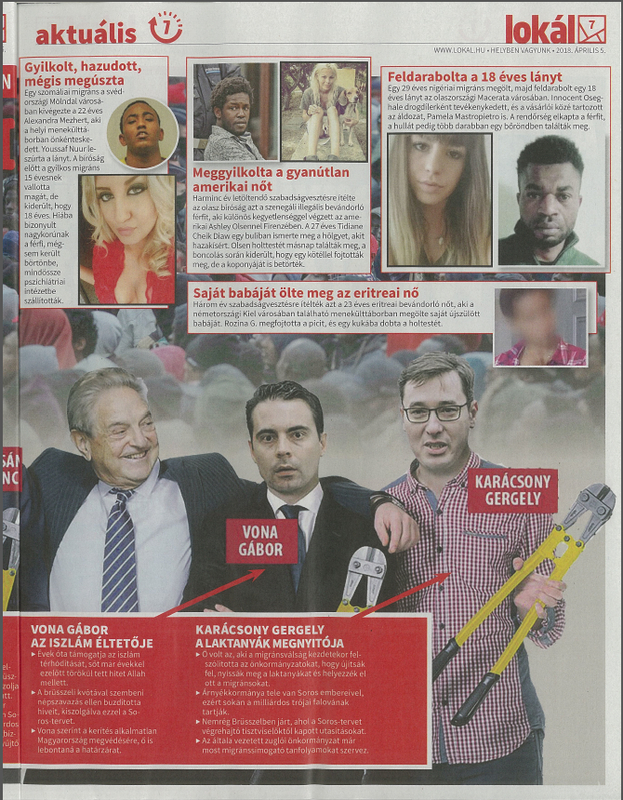 The free newspapers derive a significant proportion of their revenue from publicly financed advertisements for the Orbán government or state-owned companies such as the Hungarian Electrical Works, Hungarian State Railways and lottery company Szerencsejáték. Both free newspapers overtly support the Orbán government and the Fidesz–Christian Democratic People’s Party (KDNP) governing coalition. 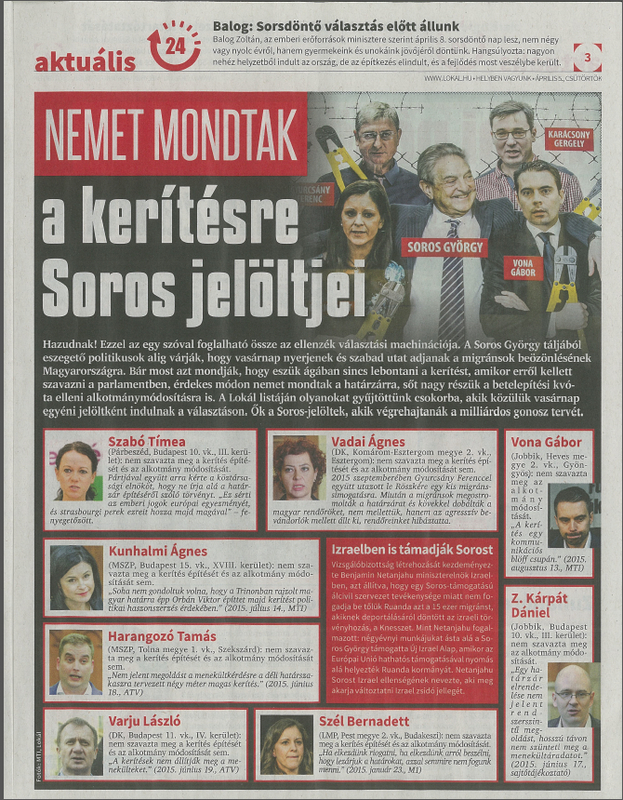 Most of the articles published in Lokál and Lokál Extra just before the April 8 National Assembly election promoted the campaign strategy and platform of the Orbán government and the Fidesz-KDNP alliance, portraying Muslim migration as a grave security, cultural and religious threat to Hungary and depicting Prime Minister Orbán and the parties under his command as the political forces that are willing and able to defend the country from this menace and the opposition parties and their leaders as the pawns of Hungarian-American investor and philanthropist George/György Soros and the local proponents of his alleged pro-migration policies known collectively as the Soros Plan. Appearing underneath the scanned images of pages from Lokál and Lokál Extra are translations of the main titles and some of the secondary titles from the given page as well as excerpts from the text of some of the attending articles. 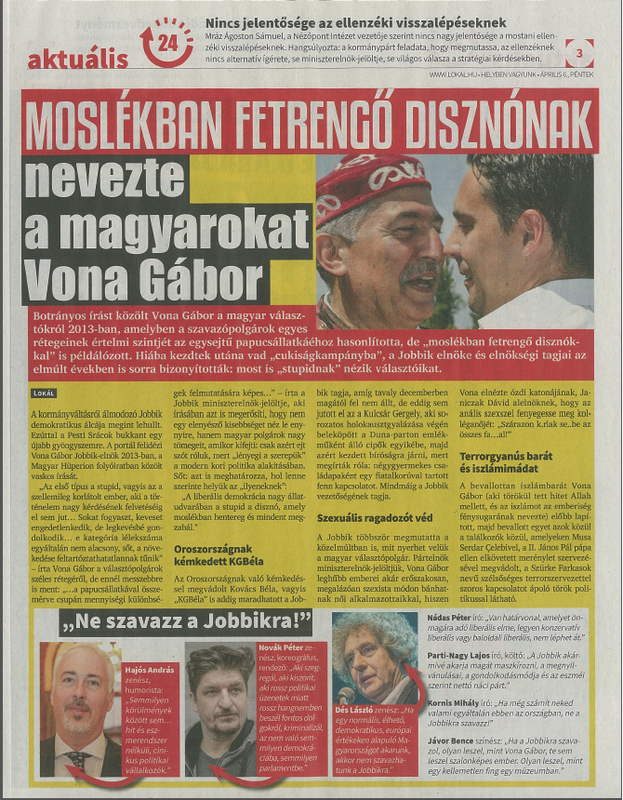 Note that Gábor Vona, who is the subject of many of the articles appearing below, is the president of the opposition party Jobbik. 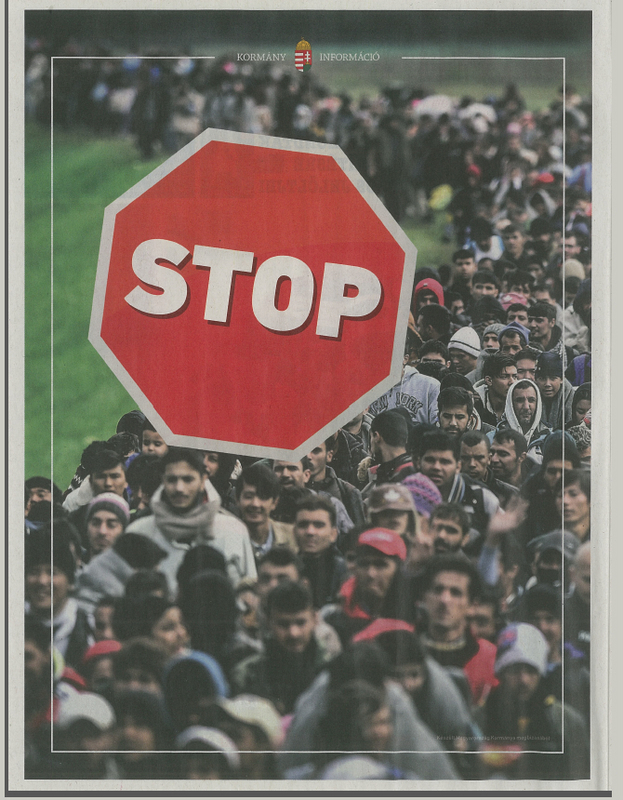 Orbán government campaign advertisement showing a stop sign superimposed on a dense column of migrants marching through the countryside somewhere along the Balkan migration route in 2015. 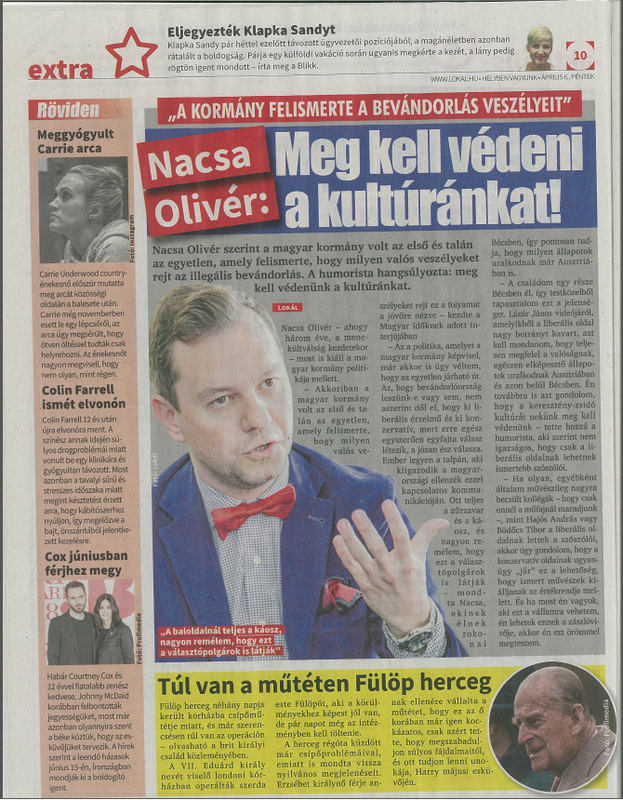 “The Government Recognized the Danger of Immigration” Olivér Nacsa: We Must Defend Our Culture! Péter Hajdú [television program host]: THE FENCE MUST REMAIN! 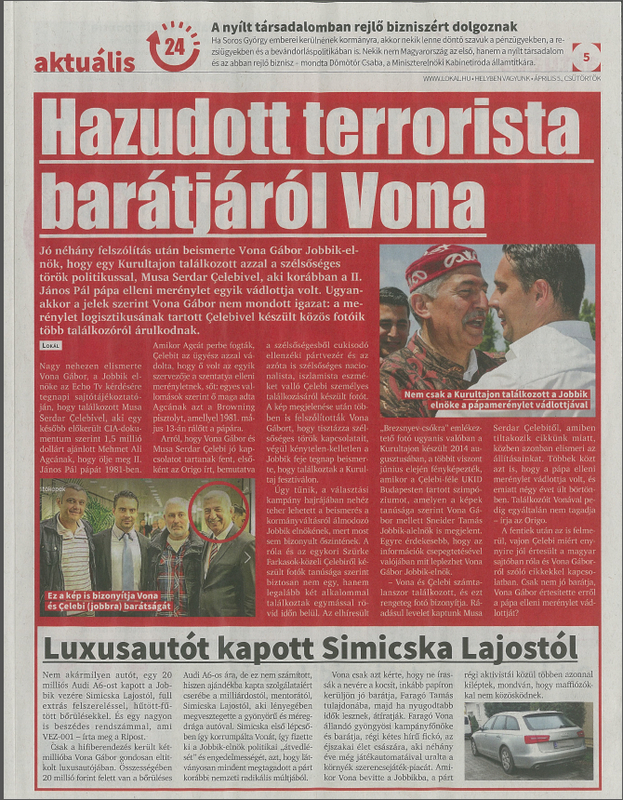 One of Those Accused in the Assassination Attempt against the Pope IS THE MUSLIM FRIEND OF GÁBOR VONA!